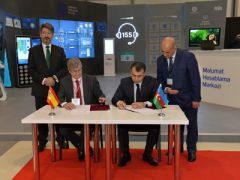 Within the framework of the International Telecommunications and Information Technologies Exhibition and Conference Bakutel 2017 taking place in Baku, an agreement on cooperation between Data Processing Center (DPC) of the Ministry of Transport, Communications and High Technologies of Azerbaijan and the Spanish company Cibernos was signed. The agreement envisages expansion of cooperation in the field of ICT and exchange of experience on the projects of “Smart City” and “Internet of Things”. It should be noted that Cibernos is one of Europe’s largest technology companies and has 50 years of experience. The company offers its electronic solutions in several European countries.